Pursuant to CSMS Message 18-000421, CBP released guidelines for identifying third country antidumping and countervailing duty (AD/CVD) case numbers in the Automated Commercial Environment (ACE) system. The system features a searchable list of all AD/CVD cases for users. Generally, AD/CVD orders cover products from the country identified in the AD/CVD order, and in some cases, merchandise produced in the country of the AD/CVD order may undergo further processing in a third country and remain subject to the AD/CVD order. 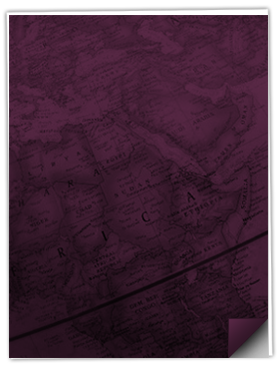 Regardless of the further transformation that occurs in the third country, the merchandise may remain subject to the AD/CVD order from the original country. When this happens, for AD/CVD purposes, these goods fall under the scope of the original country; however, for CBP purposes these goods could be classified under the CBP country of origin of the third country where the further processing occurred. The following guidelines help importers identify subject merchandise entering the U.S. from a third country. The third country case name and short description in ACE are consistent with the Case Name and Short Description of the relevant AD/CVD order. For the third country case number, at the end of the Short Description and Official Case Name there is also a reference to the country of the relevant AD/CVD order. The chart below shows an example of third county case. In this example, merchandise produced in China is further processed in Lithuania. After the additional processing, the merchandise still falls under the antidumping duty order on solar cells from China, but for CBP purposes, now has a CBP country of origin of Lithuania. For importers to properly report the import of this merchandise to CBP, Commerce created the third country case number A-451-988 to correspond to the antidumping duty order on solar cells from China, and the CBP country of origin of Lithuania. If you have questions on third country AD/CVD case numbers in ACE, contact the Call Center for the Office of AD/CVD Operations, Enforcement and Compliance, International Trade Administration, U.S. Department of Commerce at (202) 482-0984. Did you know that EPA regulates pesticide products and devices? When we think of imports, we automatically think of Customs and Border Protection (CBP), duty rates and classification of merchandise. However, if you want to be successful and compliant when importing into the US, it is important to be aware of the various Partner Government Agencies, known as PGAs, who also play a key role in regulating the import of merchandise into the United States. The United States Environmental Protection Agency (EPA) is a PGA that regulates imports of vehicles and engines, ozone depleting substances, toxic substances and pesticides/pesticide devices under the Federal Insecticide, Fungicide, and Rodenticide Act (FIFRA) and the Federal Food, Drug, and Cosmetic Act. Today, we will be focusing on pesticides and pesticide devices. The first question to be asked is: What is a pesticide? If a product meets the definition of pesticides, it will need to be registered with EPA prior to importation (unless excluded from regulation by FIFRA). See 40 CFR 152.6 for a full list of exclusions. EPA conducts ecological risk assessments as well as human health risk assessments and grants a "registration" or license that permits a pesticide's distribution, sale, and use only after the company meets the scientific and regulatory requirements. It is also important to know that domestic producers as well as foreign producers must have their establishments registered with the EPA. Now that we know what pesticide substances are, let’s define pesticide devices, which are also regulated by the EPA. A device is any instrument or contrivance (other than a firearm) that uses (in general) physical or mechanical means to trap, destroy, repel, or mitigate any plant or animal life (other than man and other than bacteria, virus, or other microorganism on or in living man or other living animals); but not including equipment used for the application of pesticides when sold separately therefrom. Products that control pests via electromagnetic and/or electrical emissions, or subterranean explosions are also considered pesticide devices. If a product meets the definition of a pesticide device, it will not be subject to the registration requirements that apply to pesticides and pesticide products under FIFRA. However, they are still regulated by the EPA and must be produced in a registered pesticide-producing establishment. Some exclusions include mousetraps, fly swatters, tillage equipment for weed control, and fish traps. Should you have any questions, please contact our regulatory compliance team. The European Union and Japan have signed the bilateral EU-Japan Economic Partnership Agreement (EPA), strengthening trade liberalization efforts in the face of growing global protectionism. The agreement will eliminate $1.2 billion worth of tariffs for European exporters to Japan and about $2.5 billion worth of tariffs for Japanese exporters to Europe. The tariff reductions are primarily in the agricultural and automotive sectors. Looking to take advantage of the EU-Japan trade agreement? 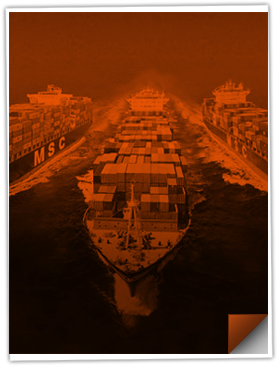 Contact your Shapiro team assist you with your global shipping needs, including global logistics management services. 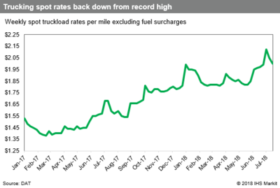 2017-18 has represented a very strong run for U.S. truckload demand. Starting most significantly at the end of the second quarter of 2017, many carriers have found themselves in a situation of having several shipments in queue each morning, and able to pick and choose which loads to accept based on evaluating the profitability of each booking request. This considerable reduction in capacity has resulted in a sharp upward trend in weekly spot rates since September of 2017 (see below chart from the JOC). With improved financial returns relative to past years, many U.S. trucking companies have made the choice to increase investment on asset upgrades and operational enhancements. In a recent JOC article, Werner Enterprises commented that “they are continuing to invest in newer trucks and trailers in 2018 to improve driver experience, raise efficiency within their operation, and more effectively manage maintenance, safety, and fuel costs”. Many in the industry predict strong demand through the end of the third quarter of 2018, which certainly will put continued pressure on shippers to provide timely and accurate forecasting to their carriers well in advance of cargo ready dates and allow for the best opportunity to secure the desired pick up dates for their shipments. The frustrating chassis shortage witnessed throughout the Southeastern U.S. is being addressed through the addition of the Southern States Cooperative Pool (SSCP), which was approved by the Federal Maritime Commission (FMS) in late July. The new pool will bring together resources from a multitude of states and is expected to increase container transport efficiency by twofold. Griff Lynch, executive director of Georgia’s port authority, recently said in an interview that “there are simply not enough chassis in the existing pool and the entire South Atlantic is running short too often”. He also goes on to say that with the 33% volume increase since 2013, the 3-5% growth of chassis within the same time frame is not sufficient. In addition to adding more chassis, there’s a push to enhance chassis quality as well. The “premium chassis” that will be utilized by the SSSCP have anti-lock brakes, LED lights, radial tires, and reliable electrical wiring. Cargo owners and trucking companies demanded this upgrade, saying that they need the best equipment. American Intermodal Management, and other new chassis providers, also back the SSCP. The new chassis will be held at the Wando Welch Terminal in Charleston, and the Garden City Terminal in Savannah. The North American Chassis Pool Cooperative (NACPC) will be the owners and operators of the new pool. Dave Manning, NACPC chairman, explained that the truckers will pay a single fee and the service will be provided at a cost, but no profits will be distributed to NACPC owners. The SSCP takes effect on August 2nd with Alabama, Florida, Georgia, North Carolina, South Carolina, and Tennessee ports participating. This will allow the Southern Atlantic to supply the necessary resources for the growing post-Panamax vessels that are replacing the smaller ships. The southern states comprising the SSCP hope that this will increase the growth of their ports and allow them to compete more aggressively with Western and Northern ports. As Amazon continues to grow at an ever-increasing speed, warehouses are having to become more intelligent and pro-active in dealing with increased demands for storage, while the supply continues to decrease. To help alleviate some of these demands, on June 30th, Amazon announced that they were launching an Inventory Performance Index that measures inventory performances of third party sellers. This performance index – or IPI- accesses customers on a scale of 0 to 1,000 on a quarterly basis based of how long products stay in inventory. If scores drop below the 350 threshold, then sellers will be prevented from sending new or additional products to Amazon, while also having to pay additional ‘overage fee’ on the inventory that is not selling. This new program is a break from the prior policy as sellers will no longer be able to utilize unlimited storage despite of how successfully they allocate their inventory. The implementation of this policy is meant to curb the massive and rapid influx of new cargo that is coming into the fulfillment warehouses and penalize customers that are not selling their cargo. Because of this, many sellers have had to seek alternative options for the storage of their cargo before sending their cargo to Amazon, or only sending enough to meet current demands of customers. 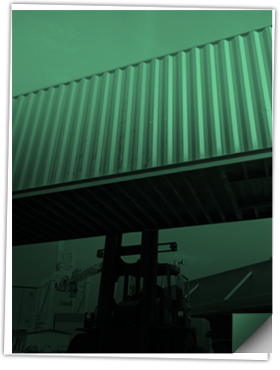 Many sellers have begun to seek 3rd party logistics provides – 3PL – which not only offer storage, but also can assist with fulfillment and pick/pack services. What does this mean for customers? I’m glad you asked! The implementation of the IPI will penalize customers that are not efficiently selling their inventory. Because of this, customers will have to choose to either pay these fees, or have their products removed from Amazon and sent elsewhere. Customers will also likely begin exploring these alternative 3PL services to help alleviate the increasing rates from Amazon. Ocean carriers are cutting services as US trans-Atlantic container trade growth with the EU slowed in the first 5 months of the year. US imports rose 5.3 percent to 1.3 million TEU’s but this is down from the 5 percent increase for the same time last year. To cope with the slowdown and maintain profitability the carriers have pulled service. Hyundai and Evergreen ended 2 services while OOCL will withdraw 2 sailings starting in mid-August and another in early September. In addition, the Ocean Alliance cancelled its TAT4/TAX loop 2 months after it’s first launch. The 2M Alliance is restructuring its network as well. In recent weeks all 3 of the big alliances have withdrawn Asia to USWC services. The weight of tariffs have yet to come into effect but already the trade war is shifting trade flows by way of ocean freight routes. With the service updates all 3 alliances will have altogether reduced more than 31,000 TEU’s a week of capacity. US ports have not seen any downturn in volumes and instead continue to report record high numbers. This may be a consequence of a rush to import products ahead of tariff increases and an early peak season. These moves are to help carriers with their bottom lines but how much of an impact these moves will make remains to be seen. What hasn’t helped is a sharp increase in fuel prices and charter rates. With Cosco Lines being the latest victim of a cyber attack this week, attacks against 2 large shipping lines could be a wake up call to BCO’s and how they interact with ocean carriers for bookings and containers status events. throughout the supply chain. While Cosco has been able to assist customers using email transmission for cargo bookings, the terminals are feeling the pressure when having to process documents and delivery orders from Cosco manually. All terminals are taking steps to protect themselves, screening all emails prior to distribution slowing down the operations even further. While this latest attack is not as bad as the crippling cyber attack on June 27th 2017 against Maersk Group it is a reminder to shippers and customers to think about overreliance on 1 carrier or one provider. Although some carriers have plans in place this is also a reminder to take another look at their vulnerability. Carriers are more at risk due to multiple offices worldwide and giving third party access to their computer system. It is essential for companies to have a cybersecurity plan afloat and take steps to bolster its firewalls to stop attacks from happening. The lack of chassis across the United States has been a problem for US ports, and the absence of enough repairmen has certainly contributed to this persistent issue. A shortage in mechanics to immediately repair damaged chassis has aggravated the number of available chassis at various terminals, which delays the retrieval of cargo at rail ramps over the past year and has added to the challenges US shippers as they face increased drayage rates plus restrained door capacity from ocean carriers. Many chassis repair companies are cutting their workforce as it can be a low-margin business while others are frantically trying to hire more mechanics due to increased workloads. Repair companies are incapable of growing their workforce swiftly to keep pace, which has led to repairs taking longer by hours or even days. International intermodal volume has jumped by 6.1% compared to last year and has increased by 16% over the last five years, according to the Intermodal Association of North America. The number of 40-foot containers being shipped has multiplied by 24%, and 53-foot container traffic by 26% since 2013. Chassis remaining unrepaired or fixed quickly enough leads to shortages and a pile up of containers inland. Chassis shortages commonly occur with 20-foot and 40-foot equipment since they are typically older than domestic 53-footers. As more containers are transported, mileage on chassis increase just the same, which could of course lead to issues if not immediately mended. Think of the potential problems for an automobile that fails to follow its suggested routine maintenance with a vehicle mechanic. More labor is needed as increased volumes add more miles to aging equipment. However, as an outdoor job it’s difficult to hire workers for terminals in the Midwest, Mid-South or Northeast due to snowstorms and unbearably hot summers. Becoming a chassis repairman is a less attractive option compared to other industries due to the potential of severe hot or cold working environments. As the lack of available repairmen continues to be an ongoing issue amidst US terminals, shippers and truckers will simply need to continue the painful endeavor of trying to find roadable chassis in major inland locations. As previously featured in Shap Talk, Shapiro has been sharing with you the names of employees who have been recognized for their exceptional efforts and contributions to our Company. At Shapiro, we continually work to develop, challenge, and inspire all of our employees to grow individually and with the Company. This month, we would like to recognize McKenzie Dillon, Marketing Analyst in Baltimore for her outstanding performance and contributions. 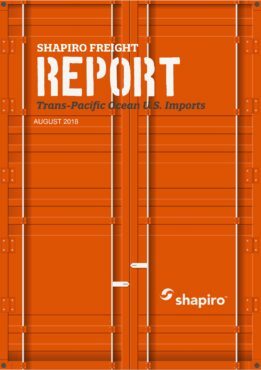 This high-level, monthly review of the U.S. import freight market to provides key insights into the tumultuous world of international shipping. From carrier alliances to labor strikes, Shapiro covers the pertinent information logistics managers need to know. Check back monthly to ensure you don’t miss key industry insights!